6th April - Karl & Ken set off for Santa Pola. I should have taken this as a sign! 30th April - 5th June Spain - Greece. We finally set off from Santa Pola on 30th April. My cousin Gordon and his partner Joyce, who live a couple of hours away, came to see us before we set off. Armed with a bag of their beautiful oranges. Well we didn't want to get scurvy along the way. So after a few hours socialising we slipped the ropes and headed north along the coast of Spain towards a place called Calpe. Things were different for us now as we had new friends with us. Reggie the Rutland (wind turbine) and Alfie the Autopilot. These guys were going to make life a lot easier. 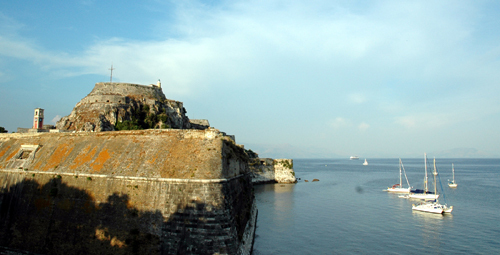 6th June - Corfu Island. Well we've made it to Corfu Island and we can finally chill out a bit. We're not planning on going very far in the next few months. We're just going to explore the Ionian and maybe a bit of the Peloponnese. Well we've made it through July and some very hot days. Its been 40 degrees at times. We've also managed to visit quite a few places and meet some more lovely people and purchased a small piece of original art as a momento, along the way. Although as I type this we're back in our usual anchorage in Corfu - has time reversed itself? August has been a great month for us as our lovely pal, Jimmy and his girlfriend Glynis came over on holiday to stay with their friends, Gordon and Margaret and we all hooked up and did some sailing. 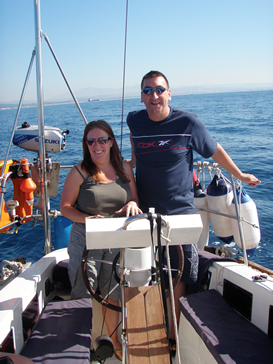 Yet another fantastic month where we met more sailing friends and also had a lovely week with Iain and Emma. 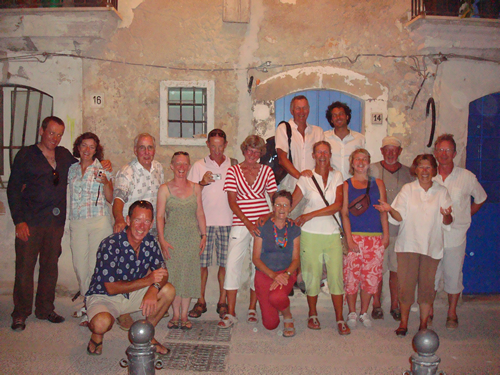 We had 3 weeks to head south from Lefkas until we got to Argostoli, Kefalonia to meet them on 20th Sept. So here we are having embarked on our final month away in Greece before returning to real life and jobs. October has been a fabulous month. Yet again we have met more lovely folk and a real bonus was our friends Kirsty and Baz, hooking up with us whilst they were on a cruise.